Becker’s recent video installation, The Pile, examines the production of desire. The installation layers the registers of film, sculpture, and social intervention to create an internal mythology of want and fulfillment: a video depicts a woman sitting in a blue chair in the center of a cornfield, hand-stitching red, talismanic objects and piling them high around her, while in the gallery, a pile of these same objects spills across the floor and the woman’s blue chair sits empty in the corner. The objects are symbols of very real desires. 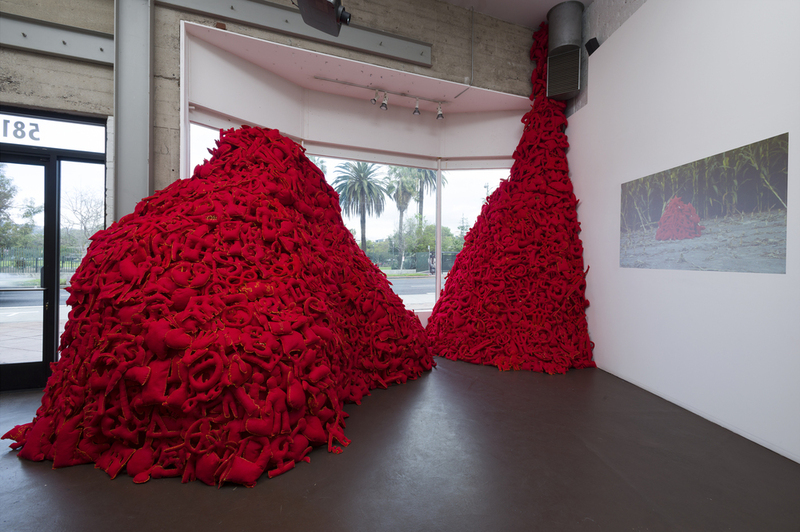 In various public forums, Becker collected over a thousand responses to the question, “What one thing would make your life better?” He collaborated with his mother, the video’s protagonist, to manifest these desires as thousands of handmade red felt objects. Each one represents an intimate longing—“keep my family safe,” “love,” “a car”—yet collectively they expose the conventional and commodified nature of desire. The work simultaneously embraces a culture of optimism and reveals its Sisyphean logic, in which desire is never fulfilled but endlessly manufactured.